The city of Xi’an in the northwestern region of China isn’t famous only for its terracotta warriors. 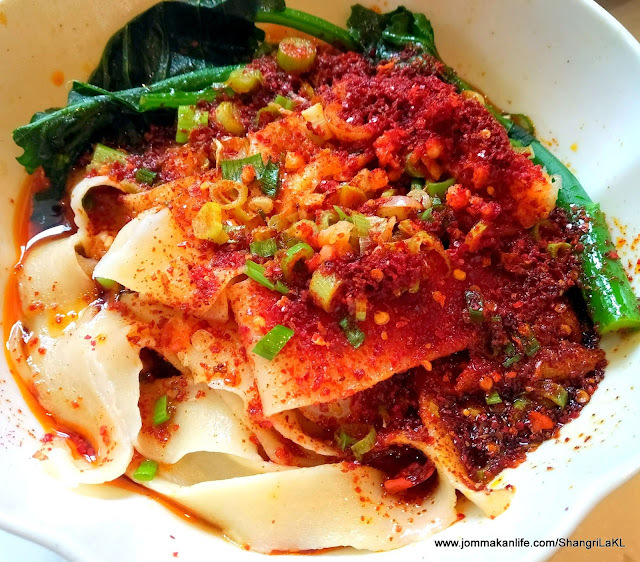 ‘La mian’ or hand-pulled noodles especially biang biang noodles tossed in chilli oil and a generous blend of chilli, Sichuan peppercorns, cumin and aromatic spices is also a major draw. 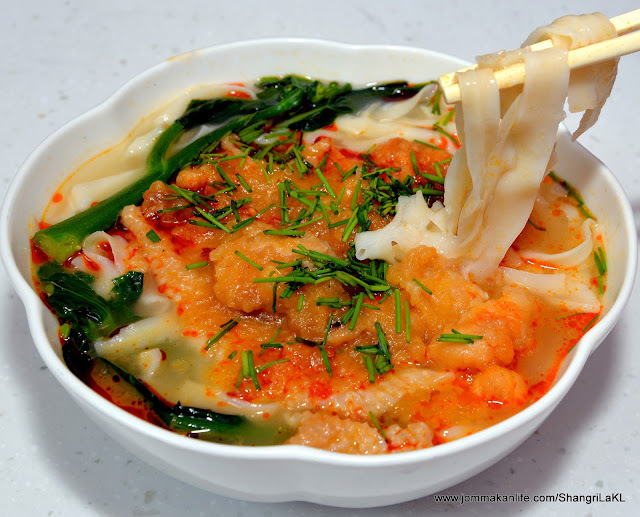 Broad, flat and slightly chewy, the Spicy Biang Biang Noodles (油泼面 RM38) by guest chef and noodle-making sifu Wang Quan from Shangri-La Hotel, Xi’an emerges as a crowd favourite during the La Mian promotion which ends 3 October. 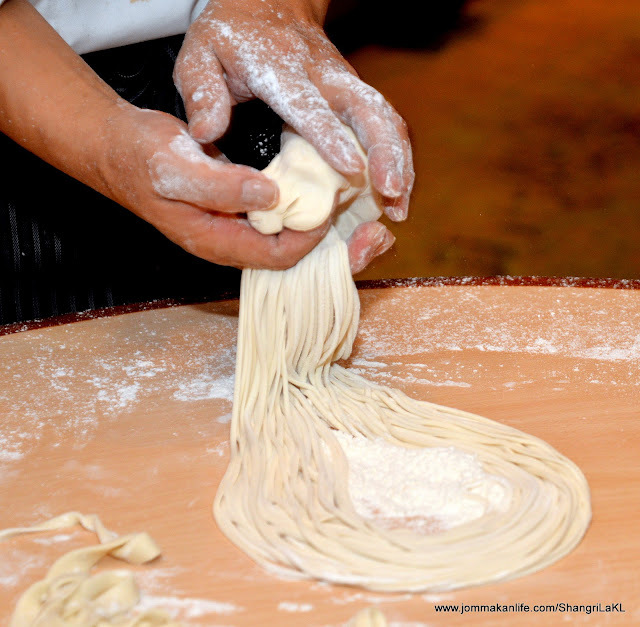 Texture-wise, the hand-pulled noodle ribbons reminded me of old-school mee hu'un kueh (hand-torn noodle dough pieces). Vivid salty-tangy nuances coupled with the slow-burning heat of the spicy condiments helped to leave an indelible impression. 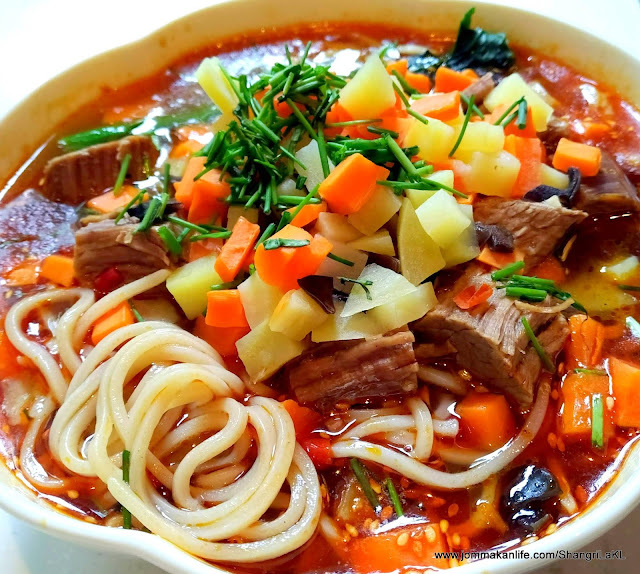 Chef Wang Quan who started his career at Bell Tower Hotel Xi’an in 1989, is adept in Shaanxi local dishes as well as Cantonese and Sichuanese cuisine. Having worked his way up the kitchen ranks, Chef Wang was previously with Shangri-La Golden Flower Hotel, Xi’an until 2007. 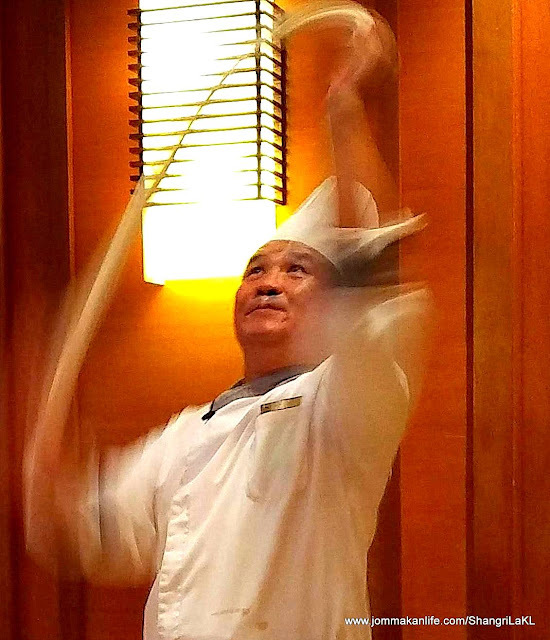 Currently, he is the Guest Service Leader at Yi Café Kitchen, Shangri-La Hotel, Xi’an. 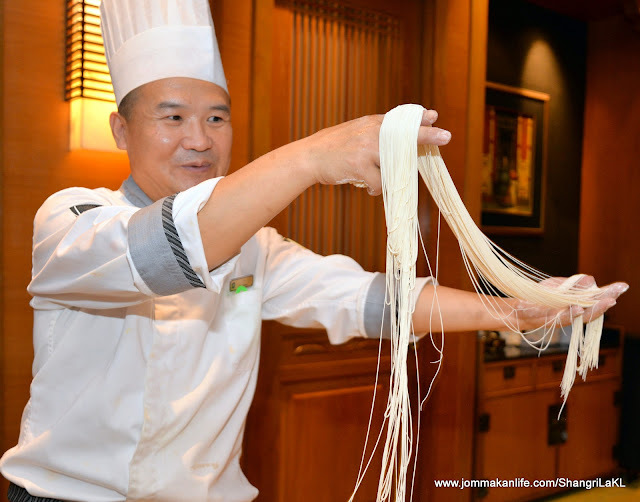 For the Shang Palace showcase, the la mian sifu proffers eight speciality hand-pulled noodle dishes. 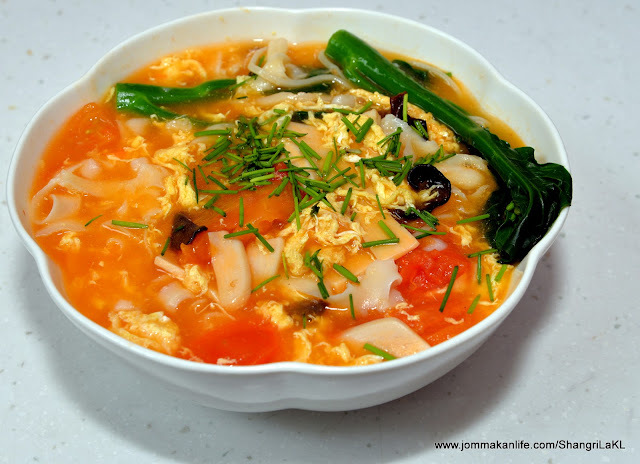 Although most of the offerings tend to slant towards the hot and spicy spectrum, the Dry Noodles with Tomato and Eggs (RM38) proves to be an exception. 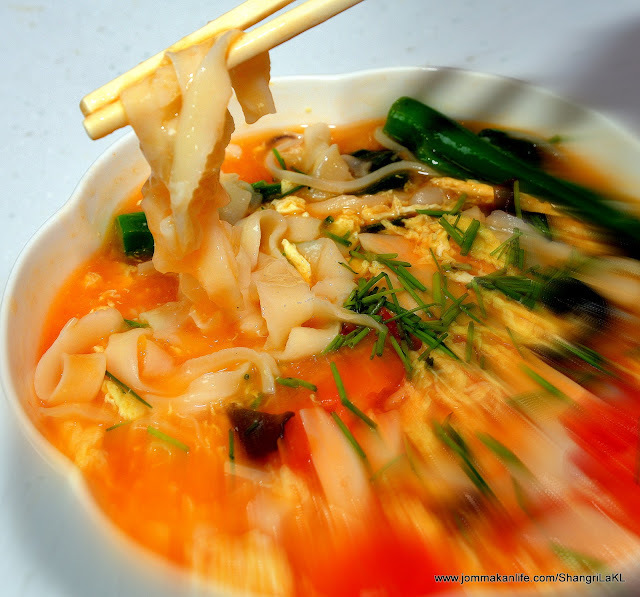 In this instance, the smooth noodles in the eggy-rich, delicate sweet-savoury broth went down well as a nice counterpoint to more feisty hot versions like the Spicy Chicken Noodle Soup (RM38). 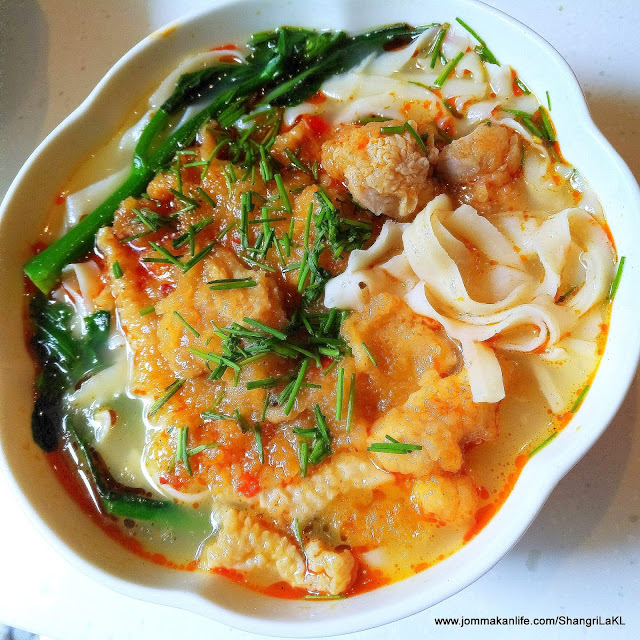 We were surprised by the unexpectedly burst of fiery-hotness from this deceptively plain soupy noodles which came topped with chunks of fried chicken, leafy greens and chives. 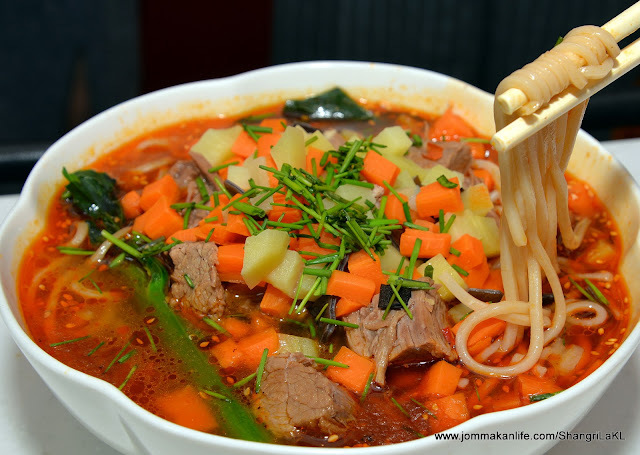 More robust flavours can be found in the Hand-Pulled Noodles with Braised Beef Soup (RM160). Fine dices of potato and carrot alongside cubes of braised beef lent appealing substance to the tantalisingly tangy broth. For this serving, the chef opted for noodle strands instead of flat ribbons. 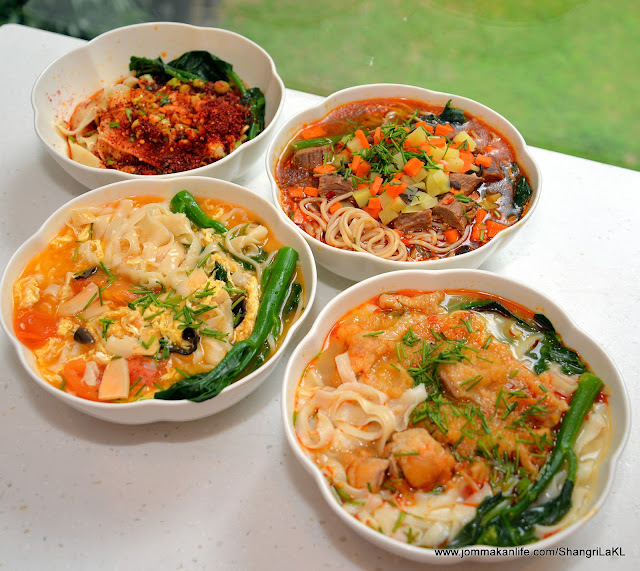 Other choices include Sliced Noodles with Braised Lamb Gravy (RM160), Shaanxi Style Hand-made Noodles with Beef and Chili Oil (RM78), Lobster Sour Noodle Soup (RM 252) and Assorted Seafood Noodle Soup (RM68). The Xi'an La Mian promotion is available until 3 October 2018 at Shang Palace for lunch (12pm – 2.30pm) and dinner (6.30pm – 10.30pm). For reservations and further information, call Shangri-La Kuala Lumpur, tel: 03-2074 3900, email restaurantreservations.slkl@shangri-la.com or visit www.shangri-la-specials.com. That's some fancy zoomed camera work! @KY - LOL, I also forgot how it works already...sei mou?!? !